Are you uncomfortable when you have to confront someone? Do you cringe at conflict? Would you like to create more harmony and cooperation? In this seminar, you’ll not only learn tools to communicate more effectively, you’ll gain the confidence to stand up to bullies, and speak your truth with grace. No longer will you have to run away from conflict or confrontation. 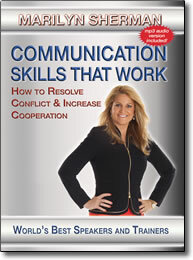 With these powerful and practical ideas, you’ll know exactly what to say, how to say it and when to say it.